Did you read the New York Times story about the young Japanese organization expert and her approach to de-cluttering a home? It’s charming. To summarize: When deciding whether to keep something, you ask yourself whether it “sparks joy.” If not, thank the item for its hard work and send it on to its next destination. Over the weekend I tried this method while continuing my pantry clean-up and found it to be fast and effective, even revelatory. The power of the approach is that you’re not thinking. I’ll give you an example: Sitting on a shelf in our pantry, we had a Nambe bowl that a distant, much older relative gave us for our wedding. Based on its scratched, slightly stained condition and the way it was wrapped, I imagined she'd probably pulled the bowl out of her cupboard the morning of the wedding and thought, "This will do." I don’t hold it against her. Not at all. We barely knew each other and she was kind to give us anything at all. Nonetheless, the painfully obvious regifting has always cast the faintest shadow over the bowl, which we’ve kept in one pantry or another for 18+ years. In case you were wondering, this is a Nambe bowl. If I ask myself, “Do I even like this bowl?” the answer goes like this: “Hmm. Do I? It’s a bit shiny and cold for my taste, which runs to old lady china and my sister's pottery. But I can see that it's handsome and I know at least two people with amazing taste who love Nambe bowls. I should definitely learn to like the Nambe bowl. Plus, aren't Nambe bowls expensive?" Then I put it back in the pantry for another half decade. However, when I posed the question this way: “Does this bowl spark joy?” the answer was immediate and unequivocal: "God, no. Zero joy. Actually, it bums me out a little just looking at it." I haven't figured out where the Nambe bowl is going next, but it's going. I can't quite bring myself to put it in a Hefty bag and take it down to the Goodwill drop box with Owen's old khakis, but I know someone else will be happy to have it and we will not miss it. 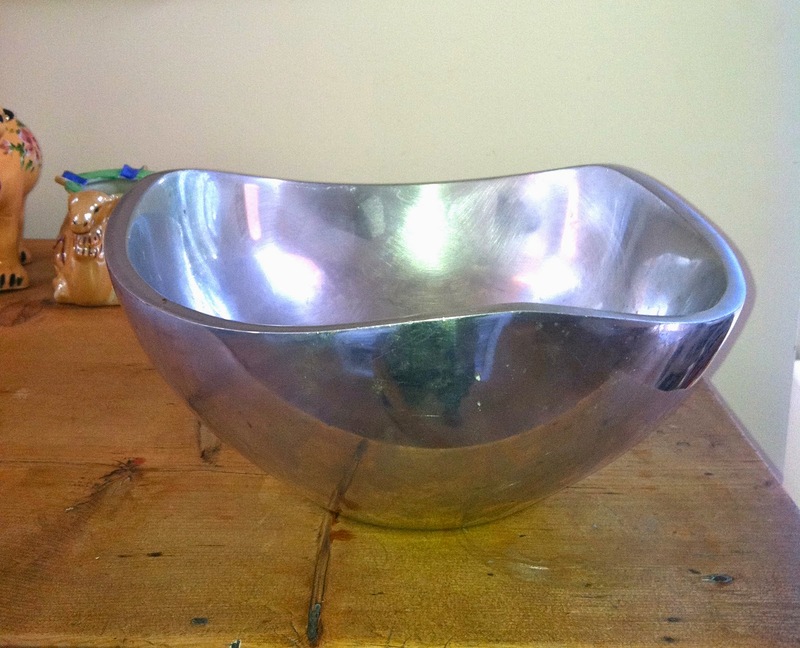 Shall I set up a blog contest and the Nambe bowl can be the prize? It's nice! You might love it. Someone should. On another subject, for the next couple of weeks, I'm going to be cooking from Plenty More, Yotam Ottolenghi’s bounteous and handsome new vegetarian cookbook. It's a wild, exciting book, much more so than the original Plenty. There are Malaysian puddings here, Persian stew, Sri Lankan curry, a carrot dish that originates in Tasmania, grilled ziti topped with feta, and a beautiful, beautiful meringue roulade with rose petals and fresh raspberries. I'm totally into it. So far I’ve cooked only the easy tagliatelle with lemon and walnuts. Butter in a hot skillet, add some shredded sage, lemon zest, and a splash of cream. Toss with pasta, parmesan, toasted walnuts, and lemon juice. If I were making the dish again, I’d use a little more butter and cream. Also, walnuts are awkward with long, flat noodles. I think the better choice would be shells, which might trap the nuts, but Ottolenghi disagrees. Aside from minor quibbles, I and my small, picky family liked this dish a lot. Recipe here. I have a major crush on Yotam Ottolenghi. HIs book "Plenty" practically changed my life. I went to see him twice! -- one day after the next -- when he was in town a few years back promoting "Jerusalem." This guy earns my respect on all counts. And he's written some lovely things about being a father. I am dying to order a few things from his website, but the shipping alone (since it would be coming from the UK) is astronomical. I look forward to hearing what you have to say about his new book... which I'll agree is a real beauty. I dropped by Omnivore Books in SF the other day and Ottolenghi had just come through. Seventy six people had turned up for the event. And it's a small store. Yes, I saw him there, too, when he was last in town. And they did a dinner at Camino that he also attended. I really am a bit of a groupie. I thought about going to see him when he was here again last weekend, but I figured I wouldn't be able to set foot in the place. (this also happened when the SmittenKitchen woman was in town, Deb something.... line down the block in both directions) I love that store but it is a bit on the small side! Did you happen to see Ottolenghi's recent rant on hummus? He is very sly, but in a charming way. Or at least I thought so. And really, who puts peanut butter in hummus? YUCK. Very interesting and, as you say, well written. Now I want to try hummus with better tahini. And an ice cube? Did I read that wrong? I used to make the hummus for the hotel I worked in (I don't remember why the job fell to me), and we NEVER had tahini. Several times the Executive Chef told me to just use peanut butter instead, which I thought was downright shocking--not just because it would taste weird (it wasn't even a "natural" peanut butter--it was Skippy or Jif or some knockoff similar), but because you could kill someone with that stupid decision. I've never made hummus with peanut butter. It sounds so wrong! Yesterday I bought some special, imported tahini at the Persian market. I'm going to have to test it against my usual -- the only kind I can even find at Safeway. The kind in the orange and brown can. What's the brand? Too lazy to run upstairs to look, but you probably know what I'm talking about. The tahini in the orange and brown can is the one I tend to use and I have no complaints, but I also haven't had this tahini he glows about (Amazon professes to carry that brand, but it's not currently in stock.) The peanut butter thing really is puzzling, but I relate completely to Kristin's story above -- there are so many ways things are just fudged through in certain kinds of hotel and restaurant kitchens. I've certainly had my share of those, and it's always interesting! I am delighted that you seem to have found your joy in the exploration of cookbooks again! I find all your posts enjoyable, but your joy is infectious. The Nambe bowl would make a good give away for someone. Not me. It seems very cold and ominous to me. Maybe for someone who loves seafood buffets? It's very cold and heavy. Maybe I will put it in the GoodWill box. Someone will see it at one of the stores priced at $3 and it will make their day. Love "Does it spark joy" - will have to look up the Times article. That is the basic system I used in my recent elimination of family heirlooms, relics and piles of belongings prior to moving and once the guilt dropped away I found it very effective. It applies to self imposed dietary restrictions and menu choices as well. A whole life philosophy in 4 little words. Excited to hear plenty more about Plenty More. Are the recipes as sweet as Plenty? Absolutely true about sparking joy. Very useful. I think the recipes are more interesting than those in Plenty. Don't know about better. Not yet. As I was reading the part about sparking joy, my eye caught the Nambe bowl pic, and I thought, "nope." So clunky and dated. I'm going to read that article. My method of choosing what to get rid of: First, I ask myself, "if everything I own burned up in a fire, would this item be something I would ever miss?" If not, I toss it. Or sometimes I ask myself, "Is it useful or beautiful?" If it is either, it stays. I know I have done a good job of ridding myself of unnecessary items over the years, because occasionally I think of something I wish I had kept. I've gone around and asked "beautiful or useful?" as well. Rarely do I miss something I got rid of. The one thing that really saddens me to this day is that when me moved from our old house I got desperate at the very end and put my grandmother's Victorian couch on the sidewalk. Other than needing new upholstery, it was beautiful, it was useful, and now it's gone. Ian needs to read that article....his college biology textbooks apparently sparked a lot of joy until I threw them out when he wasn't looking. Also, I will now have to buy Plenty More immediately. I am not allowed to touch Mark's things, much though I would like to. My girlfriend took me to Omnivore Books the last time I was up there. Loved it!! I would be there often if if was near me. I just ordered "Jerusalem" after much procrastinating and another pre release cookbook by Mimi Thorrison whose blog "Manger" I follow. Don't know what I was thinking...as if I don't have enough cookbooks! Omnivore Books is wonderful. I don't get there nearly enough. I haven't heard of Manger and will look it up. Someone at my cooking club last night was just talking about the same Japanese organization expert - now I'm doubly inspired to go through and toss my joyless items! I think Plenty More is a book that would inspire joy on my shelf... I've only cooked one dish, Ultimate Winter Couscous, from his first book and loved it. I look forward to finding out how you like the recipes from Plenty More! You'll have fun with the "sparking joy" exercise, I think. I'm trying to imagine what's in "ultimate winter couscous" and will have to go look. Your sister made those bowls? They are beautiful. I especially love the greeny-blue one, it is so rich and inviting. My sister is an amazing potter. She has these bowls that are sort of golden brown on the outside and red inside, very thin and delicate -- so beautiful. Take the Nambe bowl to Goodwill seems to be the consensus. I love the "does it spark joy" question. I gave away a coverlet my grandmother crocheted for me because although I appreciated her love and labor, I never used it. It just sat in the closet. Looking forward to Ottolenghi recipes and your family's reactions. It's hard to give away handiwork. Yesterday, I was looking at this cold red, white, and blue quilt my mother made -- it's folded in Owen's closet and I've always disliked it. My mother even disliked it. But I still can't quite pull the plug. If Owen goes off to college, send the quilt with him!! My new criterion for discarding things is, "You not take it with you, and you can't even take it with you to the nursing home." Moving someone into a nursing homes is a motivating experience. That was supposed to be, "You can't take it with you,..." I need a proofreader for everything, even a two sentence blurb! Sell the bowl on Ebay and use the money to buy cookbooks! Or crumbly cheddar cheese. I have a Nambe bowl just like yours. If you have more than one person who wants it, I'll send mine. I really like the bowl!